The latest housing data was out yesterday and continues to point to a deteriorating outlook. This will only add to the RBA’s concerns. December saw a continuation in the collapse of new household lending with a 6.4% fall in owner-occupier lending and a 4.6% decrease in investment lending. New lending to owner occupiers is now down 18.5% from its peak while investor lending has fallen a massive 47.8% from its peak. This decline in lending was largely anticipated given the slide in house prices over December and January, tighter lending standards, and softened investment from overseas purchasers. 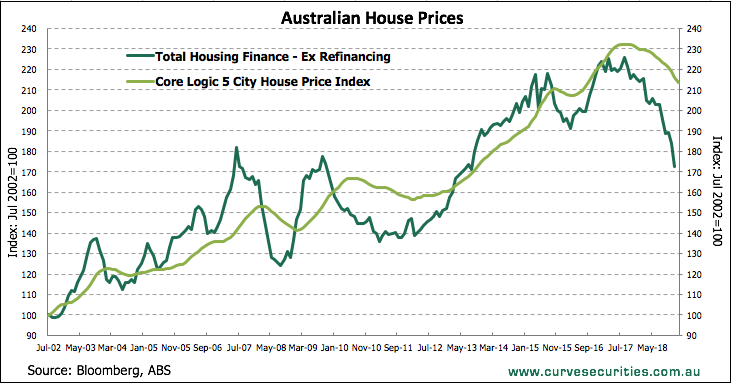 If the downward trend in weak housing finance data continues further than the RBA has accounted for and consumption softens, they may need to revise their outlook further. Continuing on the data front, the NAB monthly business survey for January saw a moderate rebound from the significant fall over December. Although business conditions jumped up 4 points and employment edged up a point, the downward trend across these and most other measures is still prominent. Moving offshore, weak retail sales over the Chinese Lunar New Year holidays may indicate soft retail sales figures and presents further downside risks to the global outlook. Meanwhile in the US, the Democrats offered to provide a quarter of the funds Trump demanded for his wall and there appears to be a tentative deal which should keep the Government open.